Aeronautical & General Instruments Limited (AGI) is pleased to announce that it has been awarded a “Design & Manufacture” contract by BAE Systems – Surface Ships. The contract is for the supply of Visual Landing Aids for the first batch of 3 Type 26 Global Combat Ships ordered by the U.K Ministry of Defence. Prior to contract award AGI had been engaged in long term discussions with the project providing a comprehensive, technically advanced Visual Landing Aid solution to support flight operations in the most demanding of sea states. The Visual Landing Aid system will support flight operations in all weather conditions, using naked eye or Night Vision Goggles (NVG), facilitating an increased operational envelope for the vessel. Through the utilisation of the very latest LED technology, the Visual Landing Aids offer increased reliability along with reduced maintenance and through life support costs. AGI is proud to support BAE Systems in the delivery and sustainment of the prestigious Type 26 Global Combat Ships. 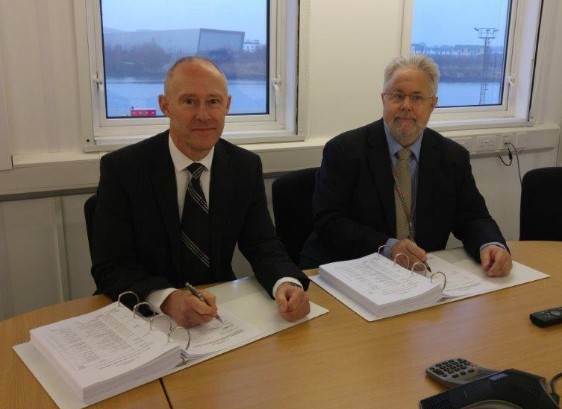 Barry Webster – Sales Manager – Ship Air Integration Division of AGI can be seen with Max Campbell –Supply Chain Lead of BAE Systems Maritime signing the Type 26 contracts above.